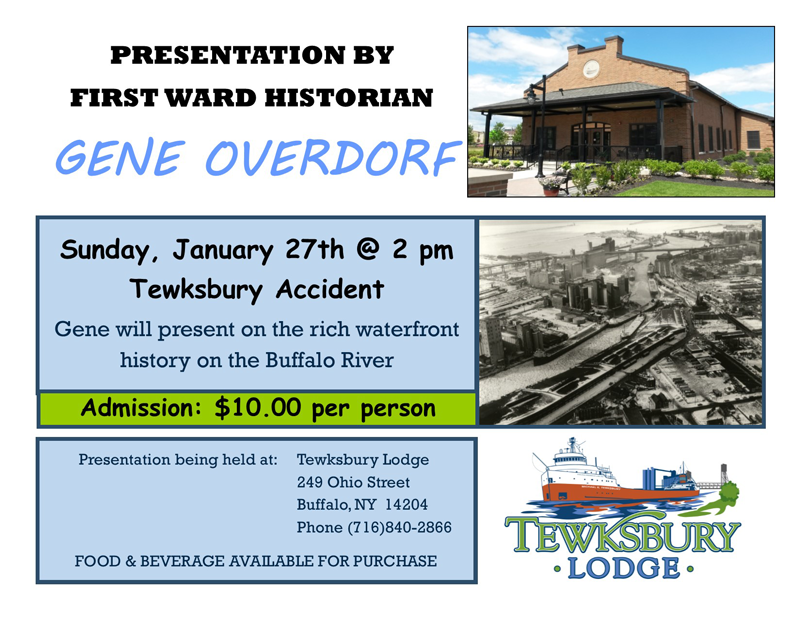 Back by popular demand will be Old First Ward historian Gene Overdorf to facilitate recollections of the famous Tewksbury Incident on Sunday, January 27th at 2pm. The event, which is open to the public, will be held at The Tewksbury Lodge located at 249 Ohio Street, Buffalo, NY 14204. Attending the event will be individuals who actually witnessed the chaos created that winter night on January 21st, 1959 when the two lake freighters – the MacGilvray Shiras and the Michael K. Tewksbury – broke loose from their moorings and made their way down an ice packed Buffalo River only to collide with, and knock out, the Michigan Avenue Bridge. The flooding that resulted extended as far as South Buffalo and the power at Mercy Hospital was even interrupted. One bridge tower collapsed and demolished two ship chandlering businesses that once stood next to the fireboat house – Engine 20. 2019 marks the 60th anniversary of the incident. The event promises to be a fun, educational presentation about a piece of Buffalo’s waterfront history with plenty of photos and stories. A limited menu and beverages will be available for sale. Reservations are suggested but not required and can be made by calling 716-840-2866. The cost is $10 per person and tickets can be purchased at the door.